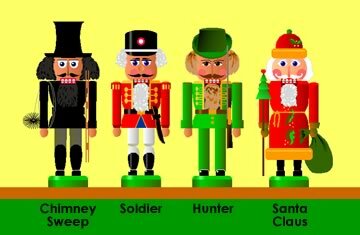 Colorful wooden nutcrackers are popular Christmas decorations. Lauren and Nicholas thought it would be fun to mix up heads and bodies and legs to see what different combinations would look like. What do you think? Would you like to try? Click here to begin. Build your own miniature Christmas Market. You can see Santa's helpers carving, assembling and painting nutcrackers. Click on a stall at right to open a PDF file. Print, cut out and fold together. Heavy, glossy photo paper works best. Secure with tape or glue if desired. See Meddybemps Miniature Village for more information. Also, learn about Christmas Markets in Germany. © 2008, 2016 Jerry Jindrich. All rights reserved. Revised 5/2/2017.